1. “Hanya Cinta Yang Kupunya” (I Have Only Love) written by Sonny JS. Performed by the group Manis Manja. From the album Hanya Cinta Yang Kupunya. Courtesy of Maheswara Musik. 2. “Cinta Terisolasi” (Isolated Love/Love Stuck Like Cellophane Tape) written by Hawadin and Lilis Karlina. Performed by Lilis Karlina. From the album Cinta Terisolasi. Courtesy of Maheswara Musik. 3. “Mungkin” (Maybe) written and performed by Patty. From the album Dulu, Mimpi & Kini (Then, Dreams, and Now). Courtesy of Maheswara Musik. 4. “Cinta Hanya Sekali” (Love [Happens] Only Once) written by Dino Sidin and Iksan Arepas. Performed by Iyeth Bustami. From the album Cinta Hanya Sekali. Courtesy of Maheswara Musik. 5. “Bunuh Diri” (Suicide) written and performed by Eternal Madness. From the album Bongkar Batas (Break Down Boundaries). Courtesy of the artists. 6. “Hijau” (Green) written and performed by Puppen. From the album S/T. Courtesy of the artists. Netral video for “Cahaya Bulan,” discussed in chapter 5 of the book, in which Jeremy makes an appearance towards the end. “Mendadak Dangdut” Trailer (Suddenly Dangdut). 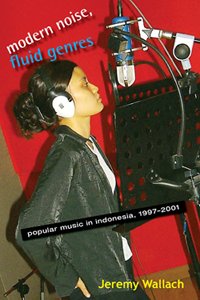 While the vast majority of music recordings produced in Indonesia (and most other Asian countries) are unavailable to Internet users as digital files, a decent sampler can be found at www.equinoxdmd.com.